Our vacation officially started on Thursday when we hit the road for a nine hour drive to Nashville, Tennessee! Chad and I love visiting cities that we can walk, talk, and eat like locals. We never thought Nashville would be next on the list, but when we heard about the famous hot chicken AND an international soccer match, we knew we had to be there! Right before we got into Nashville, we decided to stop off near Louisville to grab some dinner. I don't even know how or why we decided on this little town (I don't even know what it was called!) but we found an amazing little spot called Momma's Mustard, Pickles, and BBQ. After talking to our waiter for some time, we found out that this little joint has rightfully earned a spot on Food Network and owned by two locals. We were a bit shocked but even more excited to eat true southern barbecue! We ordered their famous fried pickles, wings, brisket tips (burnt ends), and 'sliders' which featured their smoked brisket, pulled pork, chicken, turkey, and sausage. Let's just say our first taste of Tennessee certainly did not disappoint! We made our final push into Nashville and got in around 10:30 pm. We didn't realize their was a one hour time change until we got in and questioned if we were time travelers? Sadly it was just a time change. Friday morning we decided to get up early (like 6:30 early) and get a quick workout in at the hotel. We had no clue that our entire day was going to consist of walking but hey, it didn't hurt! We decided to drive into the city around 8:30 and find a true Nashville breakfast spot. This was probably my favorite morning solely because we were one of the very few people who were actually walking the city that early. We found a breakfast spot called Another Broken Egg Cafe right off of Broadway Street. Their menu had everything from classic french toast and blueberry buttermilk pancakes, to Blackstone eggs benedict and omelettes with avocado and chorizo. At this point, temptation/realizing vacation only comes once a year set in and we ordered just about everything! Nashville is known for their 'biscuits' and by biscuits I mean fried balls of delicious dough, rolled in powdered sugar, and topped with an icing or honey marmalade. So much yes, so little time! After not having sugar for almost seven months, Chad broke his streak and we devoured these heaven sent fried sugar balls. Vacation means vacation! After breakfast we explored downtown Nashville before it got too crazy with people. We saw some honky tonks, the country music museum, and lots' of bridal parties. After seeing most of the city, we decided to head toward Vanderbilt University to see the Parthenon, which is a full size replica of the original Parthenon built in Athens. The building itself was enormous and full of such detail. I can't even imagine what it must have been like to build something of that size and structure! After walking around the park for some time, it was only right to find another Nashville tasty classic and convince ourselves that we were hungry. 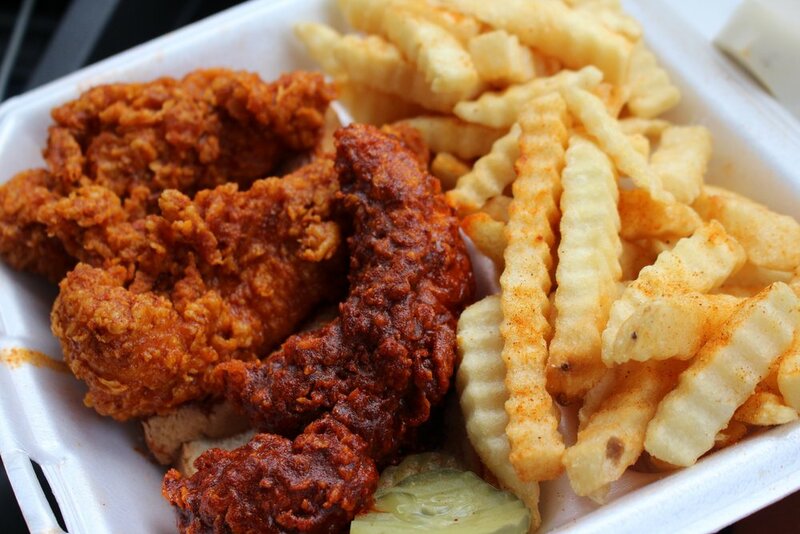 Nashville is best known for their hot chicken, and generally everyone will tell you that Hattie B's the the place to get it. Well, locals had a slightly different recommendation and I can honestly say they know their fried chicken! We decided to try a small shop known as, 400 Degrees. We drove about ten minutes outside of the city and were shocked to find nothing more than a food truck with two very hard working gals. It was a bit rainy that day so not many people were waiting in line, but we did happen to talk to a local who said he eats this chicken almost daily and it truly is the best in Nashville. At that point, our tastebuds were watering and the excitement was too real! We chickened out when we heard the 400 degrees heat would pretty much put you out for the rest of the day, so we ended up ordering a few mild (100 degrees) and one medium heat (200 degrees) tenders, which was still pretty hot! This chicken was like nothing I have ever had before. The crispiness of the breading was so light and crunchy, and the chicken tenders were so moist and tender. We both agreed that the breading and seasoning was the best part about the meal. Unlike most fried chicken recipes, this breading wasn't 'thick' or had that white casting on the bottom. As crazy as it sounds, it honestly had the texture and consistency of fresh corn flakes. My mouth is watering just thinking about it! After accepting that I could die happy after this meal, we went back to the hotel and napped it out for about two hours! This vacation was going to be on our terms so naps were definitely a must. Dinner time rolled around and we decided to make another attempt at downtown. After walking for another hour or so, we finally decided on the least busy restaurant we could find. Pizza! Yes, we had pizza in Nashville and it was pretty darn good. Not as good as Youngstown, but I don't think anything can touch Youngstown pizza. Our first full day and night was quite the success! We decided our favorite meal was the hot chicken, but those sweet biscuits were definitely up there too! We decided to head to the city early Saturday morning and try to get a spot at the very best BBQ spot in town - Peg Leg Porker. This small restaurant was recommended by Chad's brother, many locals, and plenty of Food Network stars. We tried going the night before but the line was out the door and practically wrapped around the building! We decided to play it smart and head over as soon as they opened, which happened to be 11 a.m. - so, BBQ for #brunch it was! 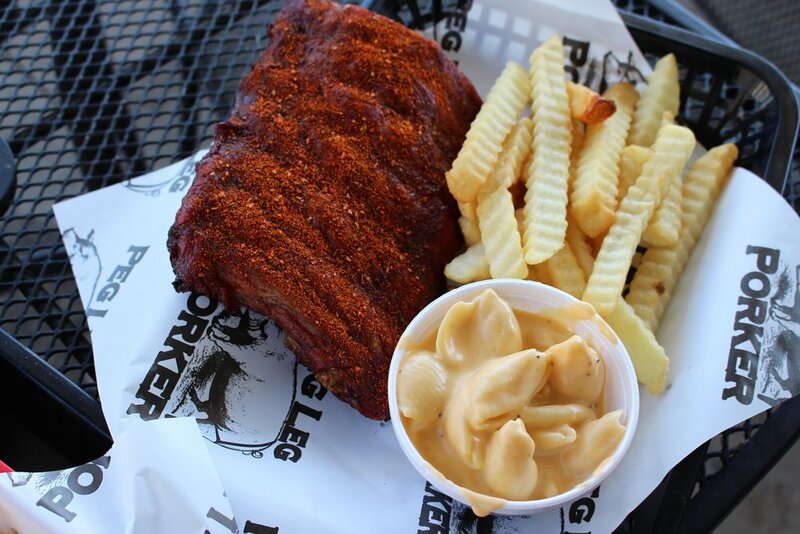 From the dry-rub ribs to the spicy and creamy mac-n-cheese, Peg Leg Porker was by far the best BBQ we have had from a restaurant. We ordered a little bit of everything so we could get a true taste, and my oh my, everything was absolutely incredible. The rub on the chicken and ribs was tangy and spicy without being overwhelming to the meat. The pulled-pork was tender and moist, even without sauce. We were blown away by the authenticity and richness of flavor that each and every meal had in store. The fries, slaw, and beans were perfectly seasoned, crisp, and tasted very fresh. - Maybe another bonus for going for brunch? We loved everything about this place, from the atmosphere to the name, and the incredible food to top it off. 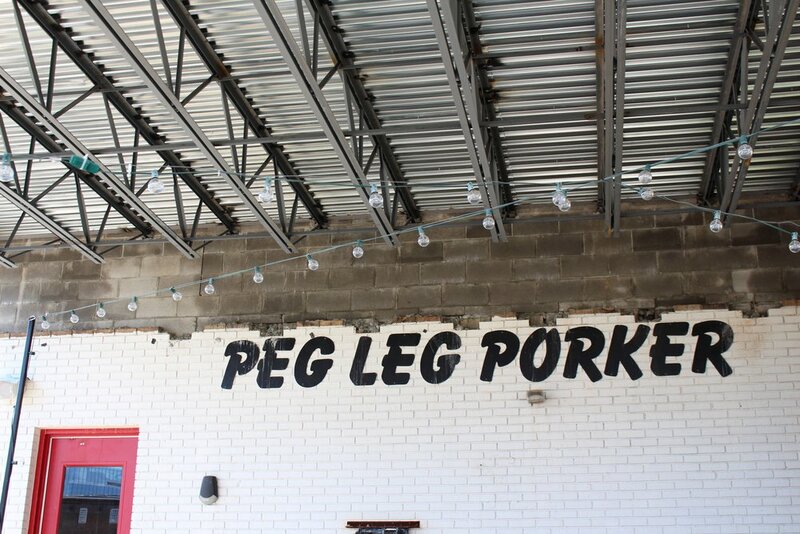 Here's a link to the Peg Leg Porker - if you're ever in town, I would highly recommend checking them out! After eating our weight in barbecue, we went back to the hotel to get ready for the Manchester City vs. Tottenham game. This game brought in a crowd of almost sixty-thousand people from all over the country, and fun fact - broke the record for the number of people to attend a soccer game in Tennessee! I'm adding that to my list of life achievements! I've always dreamed about seeing an international match, but always thought we would have to travel over seas. When we heard these two incredible teams were playing in Nashville, we booked our trip! I was over the moon with excitement about this game and it truly was so amazing to see such talented players. It was the perfect ending to our trip in Nashville! Looking back on this trip, I wish it could have lasted just a little while longer because it truly was such a needed getaway. We ate sugar, we didn't workout, we enjoyed each others company, we put our phones away, we didn't have a care in the world for anything else, and did this trip completely our way. We cherished each person we met and appreciated their kindness and hospitality more than anything. I am so happy to have experienced such a cool city in three short days. I don't regret a single calorie, workout that didn't happen, or missed Instagram story moment. I lived in the moment, appreciated the second, and will have those memories for the rest of forever. Just a little appreciation shoutout to Chad for always reminding me to live in the moment, love myself, and eat all the food. I love you more than anything, you're my person for forever, and thank you for this amazing trip!